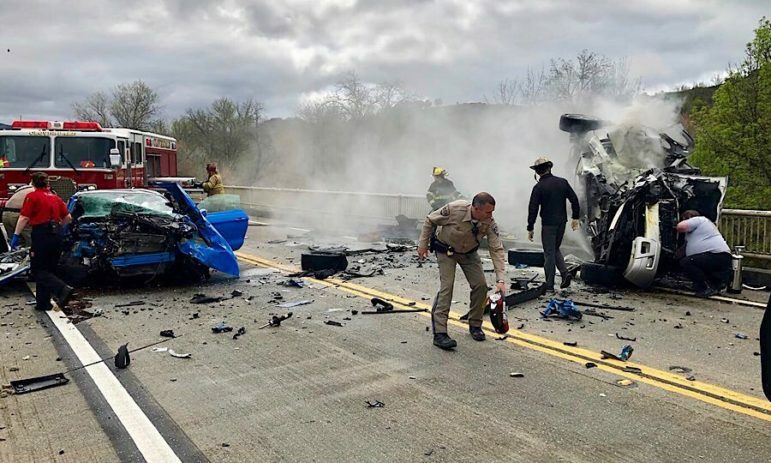 WILLITS,, 4/4/19 -- The California Highway Patrol has released a statement summing up their initial findings on the head on collision that occurred yesterday, April 3, at the Green Bridge on U.S. Route 101, south of Hopland. According to the release at about 11 a.m. Carroll Johnson, 65 of Eureka, was driving north on the 101 in a Trailblazer with a passenger, Amber Younger, 30 of McKinleyville. 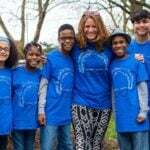 The CHP state that they believe Johnson was under-the-influence, and cross over the double-yellow line, into incoming traffic and struck a Mustang traveling south. The driver of the Mustang, Kip Ford, 24 of Eureka, attempted to avoid the collision, but the card crashed into each other, on the driver's side, resulting in a devastating crash as can be seen in the picture above. Johnson was flown to Queen of the Valley Hospital in Napa, Younger was flown to Santa Rosa Memorial. Ford, the driver of the Mustang, was taken by ground to Ukiah Valley Medical Center, and the passenger in the Mustang, Jennifer Ramirez, 19 of Fortuna, was flown to Santa Rosa Memorial. Ramirez suffered major injuries, Younger moderate injuries, and Ford minor injuries. Carroll Johnson, the diver who is presumed to have been under-the-influence, suffered major injuries and the accident remains under investigation. On 04/03/2019 at approximately 1103 hours, a silver Chevy Trailblazer was traveling northbound on US-101 approaching the Green Bridge at an undetermined speed. A blue Ford Mustang was traveling southbound on US-101 on the Green Bridge at approximately 50 MPH. The driver of the Chevy, Johnson, believed to be under the influence drifted over double yellow lines and into the oncoming lane, directly into the path of travel of the Ford. The driver of the Ford attempted to avoid a collision but the front right of the Chevy collided with the front right of the Ford, Occupants of the Chevy required extrication. The driver and passenger of the Chevy were flown to Santa Rosa Memorial and Queen of the Valley. The passenger of the Ford was flown to Santa Rosa Memorial and the driver of the Ford was transported to Adventist Health Ukiah Valley. The driver of the Chevy was arrested for suspicion of driving under the influence. This traffic collision is still under investigation. All parties are presumed innocent until proven guilty in a court of law. attempted to avoid the collision, but the card crashed into each other, on the driver’s side, resulting in a devastating crash as can be seen in the picture above.